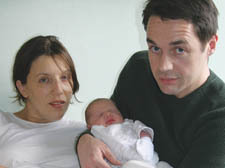 THE first baby to be born in a Camden hospital was 2008 was little girl who arrived just 13 minutes into the new year. Mr Rewal, from Edgware, added: “She must have wanted to be a new year’s baby. She’s the prettiest thing I have laid my eyes on. I could look at her for hours and hours and it’s still satisfying.” Relatives have flown in from Australia to meet the newest member of their family. Rhianna James-Moore, 29, who lives with her husband Dominic, 36, in Highgate High Street, Highgate, was also among the seven mothers who gave birth at the hospital on New Year’s Day. The couple and their eight-pound son, also yet to be named, is pictured on page one. There were eight babies born at the Royal Free Hospital in Pond Street, Hampstead, on the first day of the year. First out of the starting blocks was Adora Pireci, a baby girl born at 1.20. Her Kosovan parents Xhevat and Saranda said they choose the name because it meant “adorable child” in Latin. Adora was followed by Zakariah Hicham half an hour later and was instantly pronounced an Arsenal fan by father Saad. Kumrije Trepca, a former receptionist at the Free, gave birth to a girl later in the morning. Meanwhile, nurse Angela Adebowala, 28, was among eight mothers who gave birth at the Whittington Hospital in Archway.